ULM: What lead you to writing your spy novel, Active Measures? There was no single “light-bulb” moment for this story. I first had the notion to write some sort of spy novel in May 2002 when I was in the sixth grade. Of course, twelve-year-old me had no inclination of how to possibly tell the story that was in my head, but I let it brew over time, evolve as I evolved. And, to tell you the truth, there hasn’t been a single day over the past fourteen years when these characters and the world they inhabit haven’t been with me in some form. ULM: How long would you say it took you to write your novel? Fourteen years from inception to publication. No joke. A radically different first draft was completed in November 2011 and then the manuscript went through five major revisions right up until June of this year. ULM: As a writer, what would be the three things that you would like to share with other writers in your genre? I’m not quite in a position to share advice with other writers, but there is one thing I’m trying to accomplish with Active Measures that I’d like to see proliferate. When he accepted the Nobel Prize in literature, William Faulkner said that the only thing worth writing about is the human heart in conflict with itself. I’ve always tried to maintain that as a guiding principle. Despite the guns, the “kit,” the action, the intrigue, we have to tell stories about imperfect human souls trying to find their way. Active Measures is a story about a young man coming to terms with the death of his father. That’s it. The rest is all lights and clockwork, window dressing so that hopefully fingertips will dampen the page. As writers, we owe it to our readers to challenge them, to provide a commentary on our world for how it is, not simply how we might wish it to be, well intentioned or otherwise; to invite them inside a fictional universe we’ve created so that they may leave with a clearer appreciation of their own. I hope our genre doesn’t lose sight of that principle. ULM: Other than writing a spy novel series, what other hobbies to you have? Writing this trilogy and the prerequisite research consumes the bulk of my free time, but I’m a big film and TV buff and like to stay well read. I also hit the gym a couple times a week and appreciate a good cigar once in a while. ULM: Can you briefly share with us readers what Active Measures is about? ULM: What was the hardest part in writing this first novel of your series? Staying atop the sprawl. There are over two hundred named characters introduced in this first volume of the trilogy and three major plot lines spread over multiple continents. And, spoiler alert, there’s still more to come. It was—and still is—a constant battle with the morass of details, faces, and places; and an even greater struggle to shape it all into a compelling story. The foundation was cemented with Part I, but I think the worst of it (for me, anyway) is still to come. A second problem I’m confronting is how to tackle the ending of Part III. 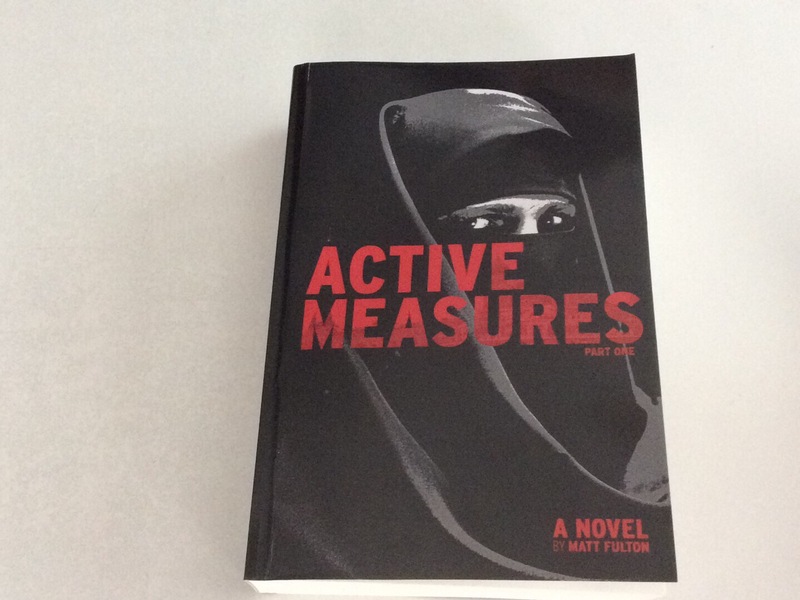 I have ideas for two novels after Active Measures. The big question right now is if I want this universe to continue beyond the trilogy. Right now I’m leaning “no.” The end of Part III will be bittersweet with very real, lasting consequences, and that’s hard for me to reconcile if “all your favorite characters are gonna get together for a new adventure next summer!” Let me make it clear: Chances are, most of your favorite characters WILL die, and believe it or not that’s a good thing. I don’t want a series based around scenarios where there’s some super spy who goes around from one stereotypical bad guy to the next. Plenty of writers have done that, and have done it well—the genre is infinitely stronger for their work—but I’m interested in doing things differently. ULM: Which one of your characters did you enjoy creating the most? That’s tough to pick. There’s a pretty deep bench of supporting characters in this trilogy—Angela Weisel, Benny Isaac, Saeed Mofidi, and Qasem Shateri come to mind. All of those characters initially had smaller roles and only became more important players as I was writing, which is always enjoyable to see. But if I have to pick one, I gotta go with David Kazanoff. He’s always been the “big bad” of the trilogy, going back fourteen years now, but how I’ve interpreted him has changed a lot. I went through a bad depression in college a few years ago and that had a HUGE impact on his character. You know, in a way, he’s not really even a villain (in the sense that, would you call a lion a villain for shredding apart a gazelle?) but more like a virus rampaging through the DNA of this story. At the end of it all—after the politics, after the tradecraft—Kazanoff is just Death coming for everyone and everything. He’s the great equalizer. If you’re really a sick SOB and want to get inside Kazanoff’s mindset, check out The Conspiracy Against the Human Race and Teatro Grottesco by Thomas Ligotti, nihilistic and anti-natalism philosophy, and any sort of cosmic horror by Lovecraft or Robert W. Chambers: ingenious writers who created monsters that aren’t scary because they render us dead, but rather render us insignificant against our own universe. All good beach reading! ULM: When will the next book in your series be published? This is terrible, but I really can’t say. Part II of the trilogy is utterly massive. There’s so much ground to cover, so much story to tell. I’m doing my damndest, but I want to be certain this book is as good as I can possibly make it. So, easiest answer to your question: As soon as it’s done. But not fourteen years like the last one, I promise! ULM: What other projects are you working that you would like to share with us readers? There may be a few other things coming down the pipeline while I’m working on the Active Measures trilogy, but it’s still too early to talk about them. ULM: Where can readers find you and your book(s) online? The novel’s here on Amazon: http://amzn.to/29IT5HW. I’m quite active on Twitter (@FultonMatt), and can also be found on Facebook and Goodreads. Also, don’t hesitate to send me an email (matt@mattfulton.net). I always love to hear from readers!